Inside combustion engines, the mixing of chemicals in fuel and air and the turbulent flames lit during ignition create a roiling, complex environment. To improve jet and automobile engine performance while decreasing pollutant emissions, researchers need to understand the exact interactions and timing of turbulence, mixing, spray vaporization, ignition, and flame propagation. Using direct numerical simulations on exascale systems to simulate the intricacies of turbulence and chemical interactions with a high degree of accuracy numerically resolving all of the turbulence scales, researchers will be able to explore key chemical sensitivities to turbulence that affect design optimizations for combustion engines that could result in groundbreaking efficiencies and decreased emissions. 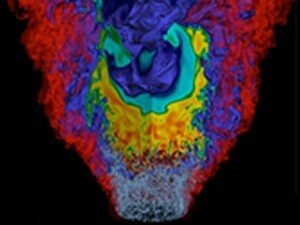 Exascale simulations will also enable new studies of combustion technologies, such as fuel and load flexible gas turbines powered by hydrogen-enriched natural gas.